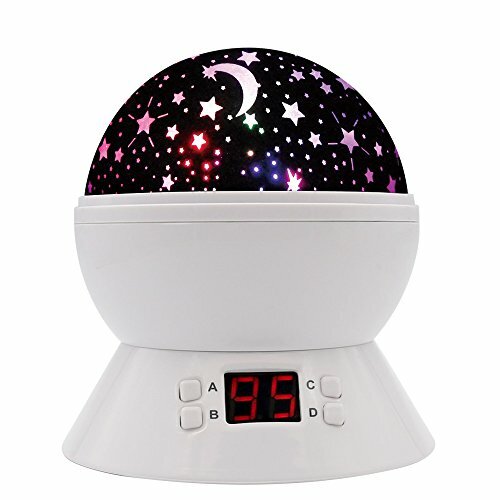 Baby Night Light stars and moon space let you meet the sky at close range. MOKOQI Night lights lamps for bedrooms, Let baby wander around in a free and happy world, and entering dreamland with endless reverie. - Higher power beads brighter and more beautiful. [ MORE BRIGHT ] Night Light Kids with 4 buttons located on the front which labeled A, B, C, and D. A - Definite Time, B - Rotary Control Button, C - Color Conversion, D - Night Light. Power by 4 x AAA battery (Not Included) or USB cable(Included). [ BABY WILL LOVE IT ] EASY AND FUN, Your child will be mesmerized by the rotation of the galaxy while feeling comfort in the projecting lights. Luminous and colorful LED lights will create a calm ambiance in your child's room, giving your child a good night's rest with this night light for kids room. If you have any questions about this product by MOKOQI, contact us by completing and submitting the form below. If you are looking for a specif part number, please include it with your message.